The response rate was 30.0%. Of those, 37.6% were males and 62.4% were females. About 34.3% were from governmental hospitals, 35.2% were from university hospitals, and 18.1% were from private practices. About 58.1% of the participants were general dentists. The characteristics of all 210 participants are presented in [Table 1]. The majority of dentists (79.0%) review the medical history of all their patients before treatment, whereas 21.0% would not do so routinely [Figure 1]a. 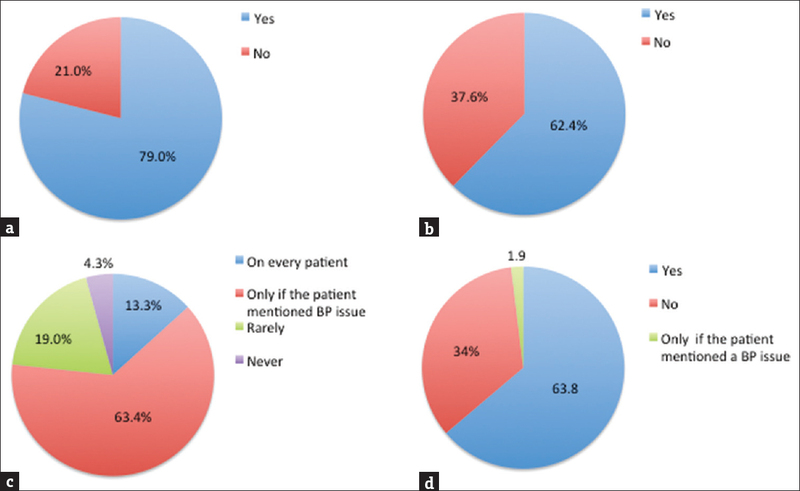 About 61.9% reported that fewer than 25.0% of their patients mentioned BP issues, 29.0% reported that roughly 50.0% of their patients mentioned BP issues, and 9.1% reported that roughly 75% or more of their patients mentioned BP issues [Table 2]. The last group was found to be statistically significant between male and female dentists [Table 3]; P < 0.05]. Regarding the behavior of dentists toward using and obtaining a sphygmomanometer for their dental clinic, 62.4% responded that they did have a sphygmomanometer in their clinic [Figure 1]b. 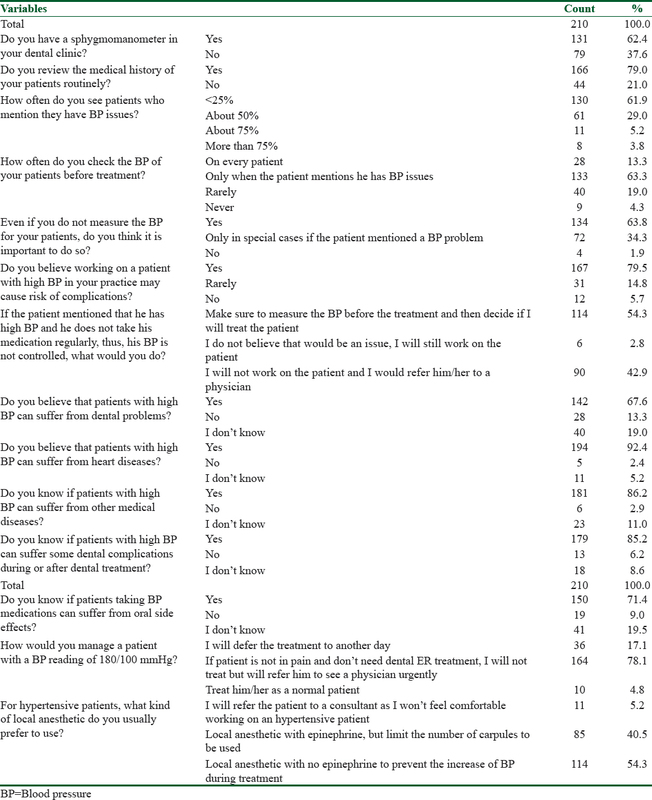 However, only 13.3% measured the BP of all their patients before performing treatment, and the majority (63.3%) did so only if the patient noted a BP problem [Figure 1]c. Interestingly, 63.8% of respondents believed it was important to measure the BP of their patients in the clinic before performing treatment [Figure 1]d. Regarding dentists' knowledge of hypertension and its relationship with medical and dental parameters, 79.5% believed that working with patients with high BP was associated with a risk of complications [Figure 2]a. Most of the participants believed that patients with high BP could suffer from heart diseases (92.4%) and other medical diseases (86.2%); 5.2% and 11.0% answered do not know, respectively [Figure 2]b and [Figure 2]c; [Table 3]; P < 0.05]. Dentists also believed that patients with high BP could suffer from dental problems (67.6%); however, 19.0% said they did not know [Figure 3]a. In addition, the majority of respondents believed that patients with high BP could suffer from dental complications during or after dental treatment (85.2%) and that BP medications can cause oral side effects (71.4%) [Figure 3]b and [Figure 3]c. Regarding the management of hypertensive patients, 54.3% of respondents would measure BP and then decide whether to perform the dental treatment if their patients noted they were taking medications but not taking them regularly. However, 42.9% of respondents would prefer not to see such patients and would refer them to a physician [Figure 4]a. The latter group was found to be statistically significant between male and female dentists [Table 3]; P < 0.05]. If a patient's BP was 180/100 mmHg, most of the dentists (78.1%) would urgently refer that patient to his or her physician and would not perform a routine elective dental treatment [Figure 4]b. When it comes to using local anesthetic for dental treatment, 54.3% of the respondents preferred using local anesthetic with no epinephrine compared with 40.5% of respondents who would still use a local anesthetic with epinephrine but would limit the number of carpules [Figure 4]c. The survey questions and summary of all the parentages are listed in [Table 2]. A summary of the significant P values is given in [Table 3]. Bhagavathula AS, Bin Zakaria N, Jamshed SQ. Knowledge of future dental practitioners towards oral cancer: Exploratory findings from a public university in Malaysia. Int J Dent 2015;2015:1-6. Carter M, Ogden G. Oral cancer awareness of undergraduate medical and dental students. Bio Med Central 2007;7:1-8. Bamhisoun MM, Alqahtani RS, Bogari DF, Al-Hazmi N, Bukhary S, Jan AM, et al. Assessment of head and neck cancer knowledge and awareness levels among undergraduate dental students at King Abdulaziz University Faculty of Dentistry. J Dent Health Oral Disord Ther 2017;8:294. Bogari DF, Bakalka GT, Hazzazi LW, Jan AM, Elias WY, McDonald NJ, et al. The prevalence of hypertension in endodontic clinics: A pilot study. Dentistry 2016;6:1000370. Fernández-Feijoo J, Núñez-Orjales JL, Limeres-Posse J, Pérez-Serrano E, Tomás-Carmona I. Screening for hypertension in a Primary Care Dental clinic. Med Oral Patol Oral Cir Bucal 2010;15:67-72. Kellogg S, Gobetti J. Hypertension in a dental school patient population. J Dent Educ 2004;68:956-64. Nakanishi R, Baskaran L, Gransar H, Budoff MJ, Achenbach S, Al-Mallah M, et al. Relationship of hypertension to coronary atherosclerosis and cardiac events in patients with coronary computed tomographic angiography. Hypertension 2017;70:293-99. Writing Group Members, Mozaffarian D, Benjamin EJ, Go AS, Arnett DK, Blaha MJ, Cushman M, et al. Heart disease and stroke statistics – 2016 update: A report from the American Heart Association. Circulation 2016;133:e38-360. Lewington S, Clarke R, Qizilbash N, Peto R, Collins R. Age-specific relevance of usual blood pressure to vascular mortality: A meta-analysis of individual data for one million adults in 61 prospective studies. Lancet 2002;360:1903-13. Ojehanon P, Akhionbare O. Hypertension among dental patients attending health institution in Endo state, Nigeria. Niger J Clin Pract 2007;10:220-3. Available from: https://http://www.cdc.gov/healthcommunication/. [Last accessed on 2017 Dec 10]. Lamster IB, Myers-Wright N. Oral health care in the future: expansion of the scope of dental practice to improve health. J Dent Educ 2017;81:eS83-90. Murray CA, Saunders WP. Root canal treatment and general health: A review of the literature. Int Endod J 2000;33:1-18. Sproat C, Beheshti S, Harwood AN, Crossbie D. Should we screen for hypertension in general dental practice? Br Dent J 2009;207:275-7. Reeh ES, elDeeb ME. Referred pain of muscular origin resembling endodontic involvement. Case report. Oral Surg Oral Med Oral Pathol 1991;71:223-7. Natkin E, Harrington GW, Mandel MA. Anginal pain referred to the teeth. Report of a case. Oral Surg Oral Med Oral Pathol 1975;40:678-80. Loushine RJ, Weller RN, Kimbrough WF, Liewehr FR. Secondary hyperparathyroidism: A case report. J Endod 2003;29:272-4. Basati MS. Sickle cell disease and pulpal necrosis: A review of the literature for the primary care dentist. Prim Dent J 2014;3:76-9. Prasad KS, Hegde C, Alva H, Shetty M. Medical and dental emergencies and complications indental practice and its management. J Educ Ethics Dentistry 2012;2:13-9. Pereira Tdos S, Pelinsari FC, Ruas BM, Avelar LP, da Fonseca VJ, de Abreu MH, et al. Postoperative complications after dental extraction in liver pretransplant patients. Spec Care Dentist 2016;36:277-81. Southerland JH, Gill DG, Gangula PR, Halpern LR, Cardona CY, Mouton CP. Dental management in patients with hypertension: Challenges and solutions. Clin Cosmet Investig Dent 2016;8:111-20. Bavitz JB. Dental management of patients with hypertension. Dent Clin North Am 2006;50:547-62. Popescu SM, Scrieciu M, Mercuţ V, Ţuculina M, Dascălu I. Hypertensive patients and their management in dentistry. ISRN Hypertens 2013;2013:8. Wang CH, Chueh LH, Chen SC, Feng YC, Hsiao CK, Chiang CP. Impact of diabetes mellitus, hypertension, and coronary artery disease on tooth extraction after nonsurgical endodontic treatment. J Endod 2011;37:1-5. Mindiola MJ, Mickel AK, Sami C, Jones JJ, Lalumandier JA, Nelson SS. Endodontic treatment in an American Indian population: A 10-year retrospective study. J Endod 2006;32:828-32. World Health Organization. A Global Brief on Hypertension. Silentkiller, Global Public Health Crisis; 2013. p. 40. Budenz A. Local anesthetics and medically complex patients. J Calif Dent Assoc 2000;28:1-9. Available from: http://www.mv-endo.com/pdfs/Local- anesthetics-Part-III.pdf. [Last accessed on 2017 Dec 10]. Momota Y, Kaneda K, Arishiro K, Kishimoto N, Kanou S, Kotani J. Changes in blood pressure during induction of anesthesia and oral and maxillofacial surgery by type and timing of discontinuation of antihypertensive drugs. Anesth Prog 2010;57:13-7. Balakrishnan R, Ebenezer V. Contraindications of vasoconstrictors in dentistry. Biomed Pharmacol J 2013;6:409-14. Ketabi M, Shamami M, Alaie M, Shamami M. Influence of local anesthetics with or without epinephrine 1/80000 on blood pressure and heart rate: A randomized double-blind experimental clinical trial. Dent Res J (Isfahan) 2012;9:437-40. Niwa H, Sugimura M, Satoh Y, Tanimoto A. Cardiovascular response to epinephrine-containing local anesthesia in patients with cardiovascular disease. Oral Surg Oral Med Oral Pathol Oral Radiol Endod 2001;92:610-6. Little JW FD, Miller CS, Rhodus NL. Dental Management of the Medically Compromised Patient. 6th ed.. St. Louis: Mosby; 2002. Yagiela JA. Adverse drug interactions in dental practice: Interactions associated with vasoconstrictors. Part V of a series. J Am Dent Assoc 1999;130:701-9. Kanaa MD, Meechan JG, Corbett IP, Whitworth JM. Speed of injection influences efficacy of inferior alveolar nerve blocks: A double-blind randomized controlled trial in volunteers. J Endod 2006;32:919-23. Barnes JN, Joyner MJ. Physical activity and cardiovascular risk: 10 metabolic equivalents or bust. Mayo Clin Proc 2013;88:1353-5. Hogan J, Radhakrishnan J. The assessment and importance of hypertension in the dental setting. Dent Clin North Am 2012;56:731-45. Becker DE. Preoperative medical evaluation: Part 1: General principles and cardiovascular considerations. Anesth Prog 2009;56:92-102. Aubertin MA. The hypertensive patient in dental practice: Updated recommendations for classification, prevention, monitoring, and dental management. Gen Dent 2004;52:544-52.